The cost is $70 and includes the course book “You Can Play Today”. If you don’t have your own ukulele, you can pre-order a good quality beginner package of ukulele, bag, tuner and strap from me for $120. For more information or to register, email ukelessonsliz@shaw.ca or call 250-586-5803. 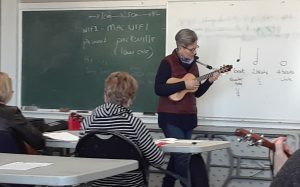 I am a Level 2 JHUI Certified Ukulele Teacher; play in the local band Revolving Doors and teach workshops and group lessons at the MAC and GZAL in Parksville. James Hill’s Sing. Strum. Spa. The second James Hill “Sing. Strum. Spa.” ukulele extravaganza is taking place at Harrison Hot Springs October 25-27th 2019. The website is now live and if you are interested, purchase your tickets soon as this event sells out quickly. Nanaimo Festival organiser, Liz Debarros will be part of the James Hill teaching team at Harrison Hot Springs. A FULL ITINERARY FOR THE FESTIVAL WILL BE ON THE WEBSITE SOON. WE LOVED THEM SO MUCH LAST YEAR, THEY ARE BACK AGAIN – THE NAKED WAITERS – NOW BASED ON OAHU – WILL BE HEADLINING OUR CONCERT ON FRIDAY 13TH. THREE JHUI CERTIFIED TEACHERS, LIZ DEBARROS, CAROL JOHNS AND ALI ROMANOW WILL BE LEADING WORKSHOPS AT VARIOUS LEVELS ON SATURDAY SEPT 14TH. THERE WILL BE AN OPEN MIC AND SING AND STRUM LEAD BY THE REVOLVING DOORS. This is the third in Liz Debarros’ ukulele workshop series. This workshop is for newer strummers and those wishing to add some cool chords to their repertoire. The ukulele, with its four strings, makes playing some difficult sounding chords easy. We will look at the magic of “chord twins”, how we can utilize the same chord shapes moving around the neck to play some wonderful songs. 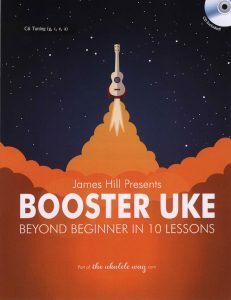 This workshop costs $30 and will use James Hill’s “Booster Uke” book which costs $19. This is the second of my ukulele workshop series to be held at Ground Zero Acoustic Lounge in Parksville. This workshop will show you how chords are made and explain the mystery of chord progressions. We will look at all the Major chords and why there are many variations within each chord. Minor chords and how they fit in to a chord progression. Chord “inversions” (don’t worry, it’s not that technical) and see how you can make chords up and down the neck. Movable chords and transposing or changing the key of a song. How to use a capo. I’ll also be showing you how to anticipate chord changes and position your fingers for quicker and more accurate changes. This workshop is also suitable for Baritone ukulele players. Would you like to improve your strumming? 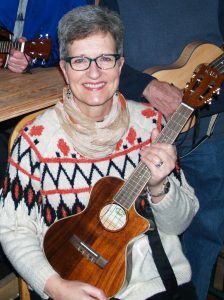 Liz DeBarros, a Level 3 JHUI Ukulele Teacher, will be giving a Strumming workshop at the Ground Zero Acoustic Lounge (GZAL) in Parksville on Saturday November 24th, 10.30am to noon. Strumming exercises using a variety of songs in different timings – 4/4; 3/4; 6/8 etc. Move on from the single, down strum and enhance your Sing & Strum experience. Cost of the workshop is $30. The workshop is suitable for Beginners who have a little experience, Intermediate upwards. Register through the GZAL website link below; scroll down to the Strumming workshop. Can you read and play treble clef notes and a few chords on the ukulele? Join other friendly and supportive players for one or more fun sessions! Wednesdays 2:30 – 3:30 pm 2018/19. September 19 to October 24. Jazz and Pop Standards. Ensemble Tunes: 45 minutes: Melody, Harmony, and Chords. Fly Me to the Moon and Moondance. Strum & Sing: 15 minutes. Group favorites. November 14 to December 12. Christmas and Seasonal. Ensemble Tunes, 45 minutes: Melody, Harmony, and Chords. The First Noel, O Christmas Tree, Chestnuts Roasting on an Open Fire and (Alvin!!) The Chipmunk Song. Strum & Sing: 15 minutes. Group favorites. January 16 to February 13. Jazz Love Standards. Ensemble Tunes, 45 minutes: Melody, Harmony, and Chords. It Had to Be You and The Way You Look Tonight. Strum & Sing: 15 minutes. Group favorites. April 3 to May 1. Early Music. Ensemble Tunes, 45 minutes: Melody, Harmony, and Chords. Scarborough Fair, Greensleaves and Suo Gan . Strum & Sing: 15 minutes. Group favorites. May 22 to June 19. Jazz Standards and Beach/Summertime Tunes. Ensemble Tunes, 45 minutes: Melody, Harmony, and Chords. Summertime and Oye Como Va. Strum & Sing: 15 minutes. Group favorites. A new four session series of Absolute Beginner group ukulele lessons with Liz DeBarros is starting at the Ground Zero Acoustic Lounge (GZAL) on Monday September 17th at 7pm. All the details are on their website http://www.gzalounge.com/ukulele-lessons.html . Liz is also excited to announce a series of six ukulele workshops to be given at GZAL over the course of seven months, starting with “Strumming Patterns” on Saturday November 24th, 10.30am to noon. Again, all the details are on the GZAL website, keep scrolling down the page to see all the workshops on offer. You can register and pay for the workshops through the GZAL website. Wow! Didn’t we all have a great time this year with Cynthia Kinnunen, Kim Bjerga, Clark Holmes, and Andrew Nufer of the Naked Waiters and Bill Naylor, Ade Barnum, Dean Williams and Liz DeBarros of the Revolving Doors. The workshops were well attended and we received very positive feedback from the participants. The Saturday night concert was a hit with stellar performances by Cynthia and The Naked Waiters. It was truly a wooo hooo time. Sunday afternoon was a blast with several performances kicked off by Katelyn & Mira, followed by several excellent open mic players. Then the concert with the Revolving Doors proved to be a big hit again this year. The sing and strum, led by the Revolving Doors showed that 100+ ukesters and friends always do have a great time when we all get together. All the performers and organizers, Liz, Melissa and Carol got up on stage to close the festival with a rousing rendition of Hey Jude. And, I think I can say, that a great time was had by all. We will be posting pictures and comments that we receive on the blog. 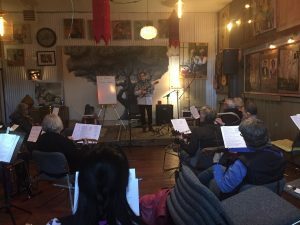 I will also be putting up information about where you can get involved with groups in your community if you play the uke and want to connect with others. We’d love to hear your feedback and any comments. Please get in touch. After the festival was over, Melody and Russ offered to take the Naked Waiters, Kim, Clark and Andy, on a sailing trip off the shores of Nanaimo. Here is the video that Melody took during their three hour tour.